The Hampton Nautical small and powerful 4” chrome binoculars are a pocket sized nautical treasure. Focusing is accomplished using a knurled focusing ring on top of the binoculars. 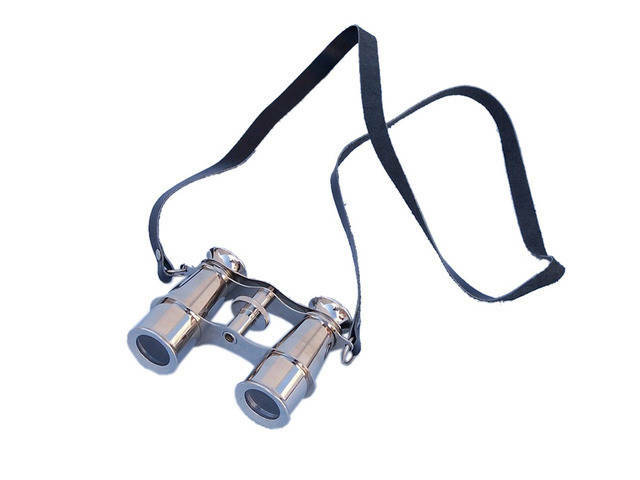 These binoculars have in-line prisms for improved field of view, 20x magnification, and have precision ground glass 1.75 inch (44 mm) diameter objective lenses. The binoculars have a leather strap and come with a handmade leather case. Custom engraving/ photo etching available; logos, pictures, and slogans can easily be put on any item. Typical custom order minimum is 100+ pieces. Minimum lead time to produce and engrave is 4+ weeks.